If using a sat-nav for directions, ignore the last 0.5 to 1 mile of directions. Once you are near us look out for the very large white ‘golf ball’ at Burrington Radar Station. We are only 400metres South from this. The radar station is shown on the map below. LEAVE M5 AT JUNCTION 27 AND JOIN NORTH DEVON LINK ROAD A361 TO BARNSTAPLE. LEAVE A361 FOR SIGN TO SOUTH MOLTON. CONTINUE THROUGH SOUTH MOLTON, THEN FOLLOW SIGN, LEFT TO UMBERLEIGH AND TORRINGTON. AT ’T’ JUNCTION IN UMBERLEIGH OPPOSITE RISING SUN PUB TURN LEFT ONTO A377. TRAVEL 4 MILES AND TURN RIGHT JUST PAST SIGN SAYING KINGFORD. AT THE TOP OF THE HILL TURN LEFT TOWARDS DOLTON AND WINKLEIGH. FOLLOW THE ROAD FOR ABOUT HALF A MILE UNTIL REACHING A RIGHT HAND BEND. LEAVE THE ROAD AND CONTINUE STRAIGHT AHEAD TOWARDS ASHREIGNEY. AFTER PASSING THE RADAR STATION ON YOUR LEFT CONTINUE ON THIS ROAD FOR 400 METRES AND TURN RIGHT, JUST PAST THE GREY GATE ON YOUR RIGHT, AT A SMALL CROSSROADS. ENTRANCE IS 250 METRES ON YOUR RIGHT. HEAD TO TAVISTOCK. FOLLOW THE A386 TOWARDS OKEHAMPTON. AFTER FOLLY GATE TAKE THE A3072 TO JACOBSTOWE, SAMFORD COURTENAY. TURN FOR WINKLEIGH ON THE A3124. CONTINUE THROUGH WINKLEIGH ON THE A3124 AND TOWARDS DOLTON/TORRINGTON. AT THE JUNCTION ‘DOLTON BEACON’ TURN RIGHT TOWARDS HIGH BICKINGTON ON THE B3217 AND CONTINUE FOR APPROX 3 MILES. TURN RIGHT AT THE SIGN on your right at the side of the road SHOWING ‘DEVON AIR AMBULANCE’ EAGLESCOTT AIRFIELD. FOLLOW THE ROAD TO JUNCTION KEEP RIGHT AND TURN RIGHT, JUST PAST THE GREY GATE ON YOUR RIGHT, AT A SMALL CROSSROADS. 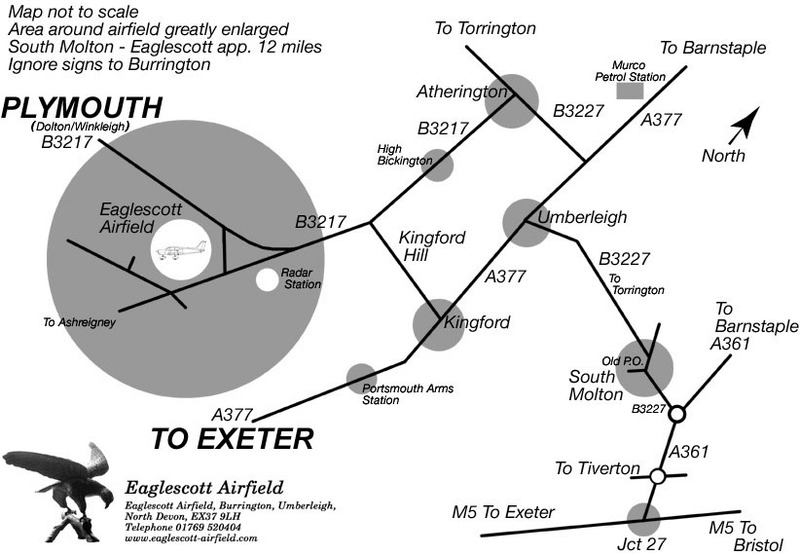 Eaglescott is situated only 5 flying minutes from the North Devon Coast. Click on the map below for a road map.